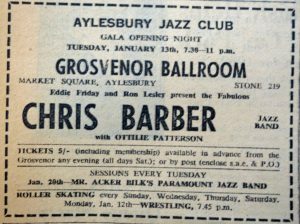 On 13th January 1959, the Chris Barber Jazz Band played at the gala opening night of the Aylesbury Jazz Club at the Grosvenor Ballroom. 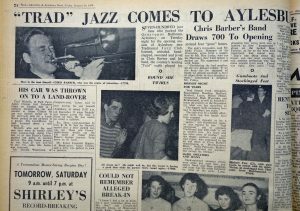 The formation of the new jazz club was the idea of Eddie Friday, manager of the Grosvenor, and Ron Lesley, who had run the Harringay Jazz Club, Ron and his wife Nanda went on to run the Aylesbury Jazz Club, and also the Ipswich Jazz Club. The next artists to appear were Acker Bilk and his Paramount Jazz Band and the Ken Colyer Jazzmen – all of which returned later in the year. Acker Bilk played six times during that first year, while Ken Colyer played five times and Chris Barber twice. Other artists appearing included Micky Ashman (6), Cy Laurie (5), Terry Lightfoot (3), Mike Daniels (3), Alex Welsh (2), Kenny Ball and Humphrey Lyttleton. Micky Ashman had played with Chris Barber and Lonnie Donegan before forming his own band. 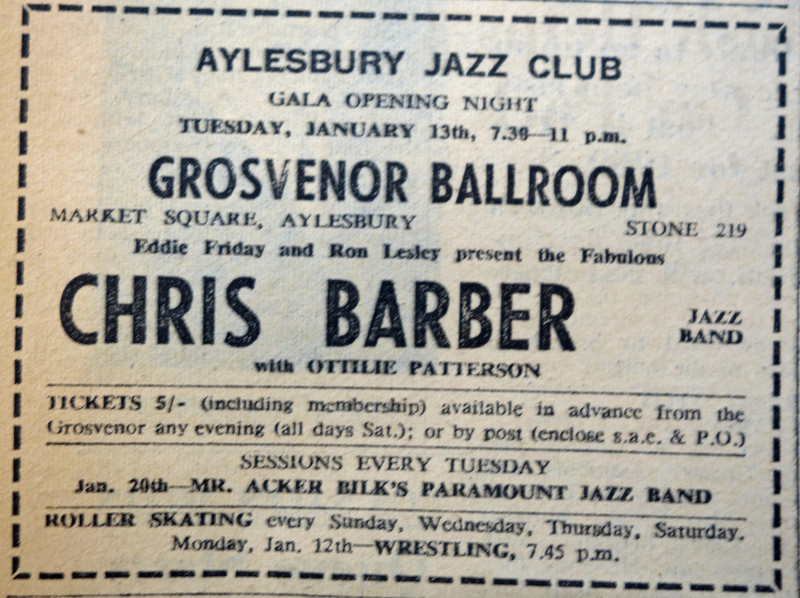 The Aylesbury Jazz Club ran on Tuesday evenings at the Grosvenor. Below are details of 45 shows during 1959. For later years, please see separate posts. Note: there are no details shown between 23rd June and 11th August. The local newspapers – the Bucks Herald and Bucks Advertiser – were not printed between these dates, and it has not been possible to find details from other sources. Can you help plug this gap please?